Political Bumper Stickers The products on this page demonstrate that we can do any size or product. We feature several discounts on stickers and on bumper magnet products. Our cheapest wholesale bumper stickers, can be found at: Make Bumper Stickers On this page you will find bumper stickers for as lowest as 10 cents each. This is our most popular page. Standard colors not shown include: White, Black, and Transparent colors. Due to variables in ink formulations, subtle color changes can occur beyond our control; therefore, perfect color matches cannot be guaranteed. Colors printed on any background other than white may appear slightly darker than shown here. We recommend that fluorescent inks be used against black or one of our dark standard colors, as fluorescent inks will eventually fade when exposed to sunlight. Transparent colors are usually used on white reflective material in order to let the reflective surface show through. Color matching is not available for transparent inks. We will help you design and pick popular colors. There is a $20 charge for each color match if you decide not to use our standard colors. We can do over 3,000 PMS color. Wholesale Bumper Stickers. Colors for any sticker we make. These are used for bumper stickers, magnetic car signs, and polycoat yard signs. 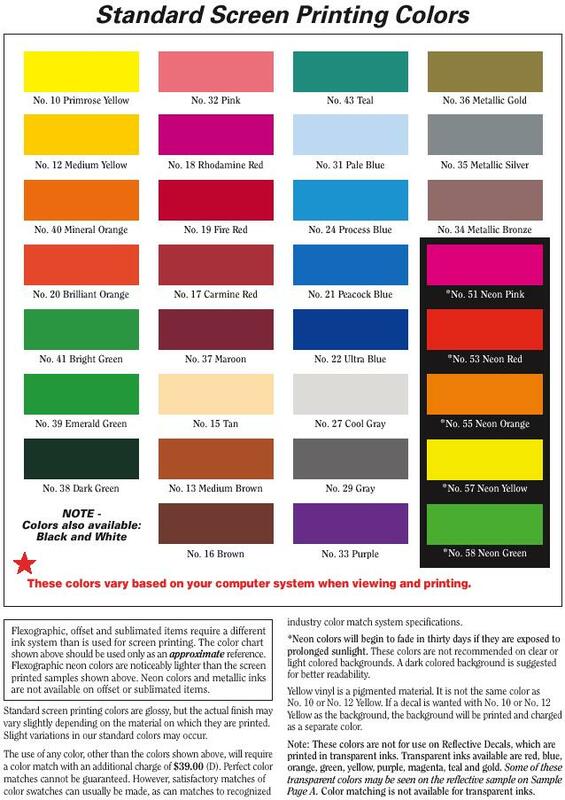 Please note that these are color representations only and are not intended to accurately display the actual printed color.